Here is a bloom from one of the bulbs in the first set we received from Adina and Steph. Chad also has a photo up (from yesterday) of the blossoms, but his appears to be of a daffodil and this one looks more like it's going to be a tulip. At first we thought they would all be the same, but it looks like maybe a mixture of two different flowers. Very cool! If you look at the bottom of Chad's photo, you'll see this particular blossom before it opened more this morning. 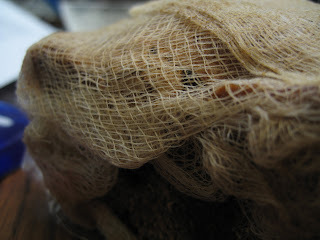 After they are done, we can plant them outside in the garden and hopefully the voles won't get them!! This will likely not be the only post about Ikea throughout the year, but it is the first! We got this catalog/brochure today from Ikea. We absolutely love Ikea, as most of you already know. We got a great gift card to Ikea for Christmas and are planning on using it to buy a cool table for our library where we can sit to do work. It will have a sort of light table built in! Very exciting! What is this? This is the parking lot at our office. Usually this surface is totally black, but they must have done a lot of salting because it was supposed to snow last night. The entire surface was all white and covered in huge pieces of salt. It was kind of gross actually ... but at least there wasn't any ice! We went to Chad's family's house today for the twins' birthdays. This is a photo of Victoria's guinea pig. 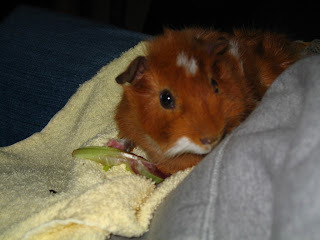 At this point, the little rodent was sitting in Chad's lap chowing down on some gourmet lettuce (actually, it was a package of spring mix, but the vet said to get that instead of iceberg lettuce). Chad really wants a guinea pig now. I guess they are pretty low maintenance, so if he wants to get one, I won't stop him. It should be interesting! This guinea pig was being very cute today. He was in his cage acting like a maniac, running around and such. Here is a photo of the sign on the outside wall of our barber shop. Everyone in Glenside goes here for haircuts. They really are the best. Getting haircuts is something I've always hated, although I love it when my hair has just been cut. Well, going to Ralph's makes it a lot easier to get a haircut. I always go to the same guy, Chuck. He does a great job on my hair and I never have to explain what I want because, of course, he does it every time I'm there so he already knows. He's also great to talk to so that makes it much more enjoyable. It also helps that Daryl's bakery is right next door, so we always know we can get a sweet treat afterward! Maybe next time we go I'll get a photo of Daryl's instead! So our neighbors, Deb and Bud, invited us to this TV Preview night. They had received an invitation in the mail and got 4 tickets. It was described as the kind of thing where you go and watch some shows that they are planning to put on the air and then you comment on them. I thought that sounded pretty neat and so we decided to go. So later Deb realized that it said we would be watching both programs AND commercials and so we started to get skeptical about it. We went there and there were about 200 people packed into this small meeting room at the Sheraton in Bucks County. They had 4 TVs set up in the front (probably about 20 or 21 inch screens each). We were seated in almost the very last row so the TVs were pretty tiny. Then we had to fill out this form which consisted of putting our address on the front, and then circling one item from each of about 12 pages of products (such as shampoo, toilet paper, etc.) that we really wanted. It was weird. Then they chose three winners to receive prizes. We then watched a horrible "romantic drama" program along with some commercials. We then answered one page of questions about the show. Next, we filled out practically the same package as the first thing (circle items you want) and they picked 3 more winners. Then we watched a sitcom that was O.K., but was clearly recorded some time in the early 80's (definitely NOT a new show). As Deb pointed out, there were no computers in the office so you know it is old! Anyway, after that we had one more page of questions about that show. After that, we had about 12 pages of marketing questions for a variety of products, such as urinary disease medications, dog foods, acid reflux medications, toilet paper, and others. This whole thing lasted from about 7:30 to 10:00, only about 35 or 40 minutes of which was actually watching television programming. The description they sent out was so clearly designed to trick you into coming and participating in this marketing research study. The best part? They didn't offer ANY refreshments. Not even water! You would think maybe they would have coffee and pastries or something, but no! Nothing! Maybe they could have given out something to everyone who came? Nope. We got absolutely nothing for our time. It took about 40 minutes to get there, 40 minutes to get back, and 2.5 hours of crap! I think Deb felt really bad about it, but I didn't mind. At least now I can complain about how stupid it was! It was somewhat amusing that it was so stupid. But just so you know, if you ever get one of these "invitations", DON'T DO IT!! So I've been wanting to post something about gas prices for a while. I think it will be interesting to see how the price changes over the year. Today I just had to post one because the price per gallon actually fell below $2 at my Wawa in New Jersey. I actually saw it for $1.98 somewhere else, but I always go to this Wawa. Isn't it amazing how the price can fluctuate? How many of you have seen that thing that compares gas prices to other common commodities. We all think that gasoline is really expensive, but when you start comparing it, there is quite an astounding outcome. For example, how much does a gallon of milk cost these days? I think it is somewhere between $3 and $4. That is significantly higher than gas. What about orange juice? That's also pretty expensive. And look at Europe and Japan. Their gas prices are easily twice as high as ours is. And guess what? They have more efficient vehicles! Do you think there is perhaps some link between the cost of gas and the efficiency of vehicles?? Oh well. For now, I'm just happy that I can get gas in New Jersey that is about 30 cents less than in Pennsylvania! Every day that I have class, Chad waits for me in his office. He has lots of stuff to do, like home work, and watching videos on the internet, etc. When I'm finished with class I have to go and knock and the door. People must think I'm crazy for knocking on this academic office door at 8:30 at night, but oh well. It's nice of him to wait for me (of course, he gets a ride home out of it!!). This is him peeking out the door at me tonight. This is a photo of the inside of my car, showing me getting home at 7:19 PM instead of my usual 5:50 or 6:00. I had to work late tonight, which isn't so bad, but getting home this late is kind of annoying. I guess that's the price you pay for making gobs and gobs of money, right? Oh wait, I don't make gobs and gobs of money!! What's wrong with this situation? Haha. This is a photo of one half of a burrito from Baja Fresh. Yes, you read correctly, this is only HALF of the burrito. It is actually called a "Dos Manos" or "Two Hands" burrito because you need two hands to even pick it up. This one is cooked "enchilado" style. That means it has sauce and cheese on top and then it is baked. Chad and I shared this for dinner tonight because we were over in the shopping center anyway and had some money left on a gift card. This place is so delicious. You have to go to understand. Chad will likely post a similar picture on his food photo a day blog, but right now he is playing with his new FREE iPod that he got so I'm going to beat him to it!! So last year on about this same date, Chad and I went to the Morris Arboretum. It was cold, but we had heard that they had a neat tree that flowers in the winter called the Witch Hazel. So we found them and they were awesome. Not only were their blossoms really neat-looking, but they had an amazingly pleasant odor as well. So ever since then we have been looking forward to going back this winter to see them. Well, as most of you probably know, we have had a very strange winter so far (weather-wise) and it was cold briefly and then very warm and then cold again. Well I think the witch hazel got confused and blossomed early and then died off when it got cold because we went there today and they were all shriveled up. We still took craploads of photos of them because they looked pretty neat anyway. They look like little creatures or something. Unfortunately, there was no real smell to them, but I guess we'll just have to wait for next year again. We really want to get one to put in our yard but they apparently require a decent amount of sun and the only place where we have space doesn't have sun. Hopefully someday we'll chop down the stupid, dirty sycamore and plant a witch hazel (and maybe a cherry blossom) tree in the front. So today I had a pretty busy/ productive day. I went to Quest diagnostics to have some blood drawn for some tests associated with the kidney stones I had back in October; I got an oil change and new air filter for my car; I bought a birthday gift and card for a friend; I went to Wachovia to deposit a check; I went to Maido with Chad and met my family there (where we watched Taiko drumming, pictured here, and ate yakisoba, curry, and gyudon); and then went to the friend's birthday party in Jersey. This Taiko performance was by the group that Matt is in. They did a good job. I'm not sure how long they have been playing and practicing together, but I think they have made great progress in the relatively little time I assume they have had together. I must also add that I'm very proud of Chad today because he drove us all the way to the party and back. He did a very good job! This is a picture of the local Pizza place near my parents' house. We used to go here ALL THE TIME. It used to be owned by a different family and we got to know them pretty well. For those of you reading who used to go there, you'll remember Sophie answering the telephone saying "Ello VINcents". It was great. Back in Junior high or high school they sold the place to someone else and it has never really been the same since. The menu and recipes are basically the same, but it's just not as fun. We still go there on occasion to get food (like tonight) but ... you know, it's just not the same. Anyway, tonight I had a cheesesteak (actually I only ate half - I was very proud of myself). Chad had french fries and a slice of pizza, my dad had stuffed shells and my mom ate my dad's side salad and garlic bread (she's a very cheap date!). I'm sorry this one is so blurry, but I just had to post it. This is a picture of Mike Borda (a co-worker) who is imitating a certain someone at the office who gets very excited when there is free food around. Well, today, someone brought in donuts for us. Mike was showing us what he thought this person's reaction was when they noticed the smell of donuts in the common area and jumped out of their seat to run down the hall while sniffing the air, following the scent to the free food. It was hysterical! I love working in my office! 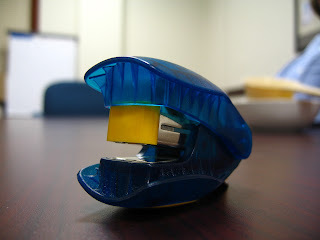 This is my favorite stapler! I got it back in college after getting fed up with the one I was using at the time. That old stapler could hardly staple 2 pages together, let alone the 9 pages I easily tackled with this mini-one from Swingline. I highly recommend their staplers to anyone who is looking to purchase one. This one is so tiny yet it has a little compartment on top to store some spare staples for when you run out. It's fantastic! Is it sad that I get so much enjoyment out of something like this? I really love stationaery and office supplies but I don't know why. Maybe it's because it gives me the illusion of being able to be organized, when in fact, I'm almost incapable of that regardless of how many supplies I get! You know how in college, student groups are always announcing that their events will have free food because that always increases attendance? Well that tactic doesn't only work for students, but for pretty much everyone. You should see how crazy people get over free food in our office. It's pretty funny actually. So one of the benefits to being a consultant is that we often hire subcontractors to do work we don't do ourselves, or we purchase products and services from various vendors (for example, we send water samples to laboratories to be analyzed). So many of these other companies like to come in and present their services to us in the hopes that we will choose them over the next company the next time we are looking for that particular type of service. We usually have them come present at lunch time and we call it a brownbag. Of course, I'm assuming that the history behind the term "brownbag" is that people would bring their own lunch and listen to the presentation. In our case, many of the brownbags include free lunch because the vendors want to get a large audience. Since my office mate, Heather, is the brownbag coordinator, I always get to chime in on what food we should have for each brownbag. Today Heather and I decided pizza was best. Here's a photo of one of the slices I had. It was buffalo chicken, which has become one of my favorite types of pizza. I know it looks pretty gross in the photo, but I assure you it tasted pretty good! I keep trying to convince Heather to do Primo's hoagies for the next brownbag, but she always has some reason why we can't. Arrghhh, I want my Primo's! Haha. I know this isn't the best picture in the world, but unfortunately, during the winter, it is dark both when I leave home in the morning and when I return home at night. Therefore, lighting conditions aren't ideal. So this is a picture of our Christmas tree sitting out on the curb, waiting to be picked up by the township and cut up into tiny pieces and composted and made into mulch-type-stuff. It's sad because it was such a perfect tree and it represented a wonderful Christmas season, which is always one of the best times of the year. Now we had to take off all the pretty tinsel, ornaments, and lights and then put it out to be reintroduced into the cycle of life. It feels like now it is officially the end of Christmas and we have to wait another 11 months or so to have it again. I'm sure it will fly by, what with how busy we are, but there are many great things to experience in between, such as cherry blossoms in the spring, BBQ get-togethers in the summer, and fall foliage (maybe with a trip to Vermont?) in the fall. I think it's going to be a great year! So every year, Chad and his Aunt Beth make cookies together at Christmas time. Chad used to go to Aunt Beth's house, but since we moved into our own house, she has started coming here instead. This year everyone was really hectic before Christmas, so we had to wait until this week to do it. Here are the cookies of choice, spice cookies. They are kind of like molasses cookies or ginger snaps but a little different. Quite tasty. Today the house smells so nicely of cookies - what a great smell! So if you are/were a fan of Ally McBeal, you may understand our excitement when we found out that my mom purchased the entire 5 seasons of Ally McBeal on DVD. Of course, she had to get it from Canada because they don't make them in the U.S. (go figure). She ordered them for Christmas but it took weeks and weeks for them to come, so we didn't get them until just this week. I had to wait to post this because my mom wanted to surprise Erin today. Anyway, we used to watch Ally McBeal all the time over the summers when we were back in the U.S. from Japan. We would just laugh hysterically at Lucy Liu because she was so funny on that show. So this is my picture from yesterday, wasn't it totally worth the wait? Haha. Sorry for not posting a picture today (well, yesterday actually since it's already after midnight). I took what I thought was my photo for the day but then my mom made me promise not to post it. So then I didn't know what to do because it was already late in the day and nothing was inspiring me. I took another one but I wasn't happy about it, so I decided to bite the bullet and just wait until the next day to post it (because I was allowed to post it on Sunday, just not Saturday - I'll explain later). Anyway, I'm very upset because I was doing so well getting one post in each day. But really, my goal was to take one photo a day, and that is what I did, I just didn't post it yet. So ... I wanted to get something up here for those of you who are up late and still checking to see if I posted yet. Fear not, I will post a Saturday picture tomorrow as well as one for Sunday! So you are probably looking at this thinking, "What the heck is that?" Well, our very good friends, Adina and Steph, who recently moved all the way to Nashville, sent us a gift recently of monthly plants to beautify our home! Today we received the first set of bulbs and this little thing is one of the flowers already sprouting up through the moss on top. They also got us a cute pot for the plants. This was such a thoughtful gift because we'll get to enjoy it all year long and I'm sure there will be some very beautiful flowers that we'll get to see (and smell!). This is going to be so much fun!! I'll definitely post a picture when these bloom and maybe I'll post a before and after photo for each one we get! Thanks Adina and Steph!! I absolutely love receiving packages. When shipping is free, I greatly prefer ordering thing online rather than going to a store because I love receiving the package (besides the fact that it is more convenient). One of my favorite places to order things is http://tigerdirect.com. They have a lot of good deals on technology (usually including sending in rebates) so I order a lot of things from them. Unfortunately they never have free shipping, but oh well. I received a package from them today and it was very exciting. I got myself a 1 GB jump drive for $4.99 after rebate and a 2GB jump drive for Chad for free after rebate (supposed to be a birthday present, but I couldn't wait that long to give it to him). 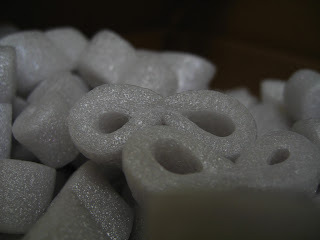 Enjoy the photo of the packaging materials! They help keep my toys safe! Ruth, the receptionist at our office, always has a bowl of candy (usually full) at the front desk. This gets people to stop by and talk to her for a second. We all really love it. Anyway, today the bowl at the front was full of dark chocolate truffles. I think they had a little dusting of cocoa powder on the outside too. Ruth has a theory that only men like dark chocolate. Women, she says, only eat milk chocolate. Well, my office-mate, Heather, always the exception to the rule (sorry Heather!) is in love with dark chocolate just like I am. However, Heather sometimes has a level of self control I can't even comprehend. While I stood up front at Ruth's desk and popped about 3 of these in my mouth one after another and devoured them all within about 1 or 2 minutes, Heather turned the consumption of just one of these little devils into a 15 or 20 minute ordeal. 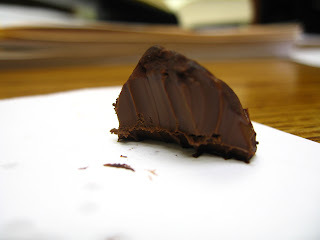 You see here a partially eaten (I would say about 1/2 gone so far) piece of the chocolate sitting on Heather's desk. I just couldn't believe how she could take only little bites of the chocolate rather than shoving the whole piece in her mouth at once! Well, anyway, they were absolutely divine! 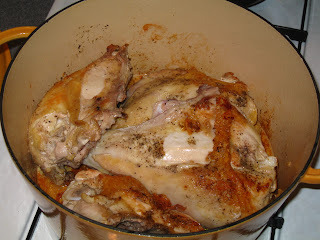 I love the way chicken looks when you brown it in a pan. This is the chicken part of the dinner I made tonight. It was from the first issue I received of my new Bon Appetit subscription (thanks Erin!). Chicken with bell peppers and smoked ham. It had smoked paprika in it, which was very tasty! So far I'm doing pretty well on my new year's resolutions (I decided to try the at least one recipe from each issue thing again). Of course, it's only the second week of the year, but I'm proud of myself so far. I feel like I've started out on the right foot. For today, I figure that I might as well combine the resolutions and post a picture of each thing I make from my magazine. My last resolution is to stay on top of my school work so that I don't get stressed out around exam time. That is going to be the hardest one for me to do because I have functioned a certain way during my entire academic career (namely, I procrastinate almost as long as possible) and so it's going to be hard to change. This will be one of the things I will just try to improve, rather than go all out and force myself to be perfect at it all year. You're all probably wondering what the heck this is a picture of! Well, this is some basic health and safety equipment for my job. In our line of work we can be exposed to a wide variety of hazards, especially chemical hazards and the possibility of injury from heavy equipment being operated on our sites. My office mate, Heather, and I don't spend a lot of time in the field, so we both found it interesting when we returned to our office today and found these little packages of health and safety gear on our desks. 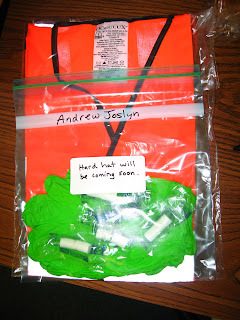 What you are looking at are some nitrile gloves (generally impervious to most chemicals), ear plugs, and an orange safety vest. I like the cute note saying that a hard hat is coming soon! How exciting!! Chad and I went with our neighbors Deb and Bud to Longwood Gardens today to see their annual Christmas display. Chad and I both took lots of photos, most of mine didn't come out because it was too dark outside. The displays were awesome with lighted trees and such. This was one of my favorite photos of the night though. This was a room of Christmas trees along with sugar sculptures. I thought this snowman sculpture was particularly cute, and I think it's neat how the Christmas tree lights turned out behind the sculpture. So before I got my wonderful new MacBook for Christmas, I used to wander into the Apple Store at King of Prussia mall and ogle at all their merchandise, especially my future laptop. Of course I never bought anything there because really all they sell are computers and ipods and then accessories for those things. Well, today was my first trip to the Apple Store after getting my laptop so now I could actually go for the accessories! I got myself a neoprene sleeve to keep my little baby safe! 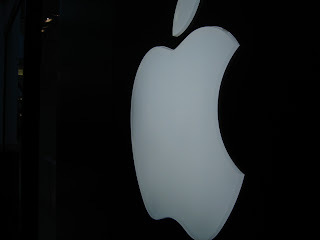 I can't wait to go to the Apple Store in New York City. Mainly I want to go because it looks really cool. I'll be sure to take a photo of it to post when I go! 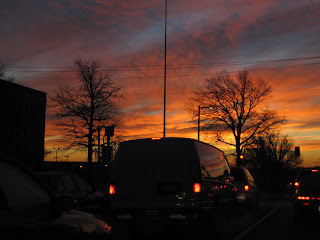 KYW 1060 is the local AM radio news channel. I listen to them every morning and every evening because they do traffic reports every 10 minutes (on the 2's). Most of the roads the feature on the traffic report are the major roads around Philly, none of which I actually use. However, I do have to cross a bridge to get from Pennsylvania to Jersey every day. The bridge I use, the Tacony Palmyra Bridge, is, unfortunately, a drawbridge. This means that whenever there is a particularly tall ship coming down (or going up) the river, they have to open the bridge and stop ALL traffic on either side. Well, I listen to KYW because SOMETIMES they announce when there is a bridge opening. If I know far enough in advance, I can take an alternate route (over the Betsy Ross Bridge, for those who care). Well, I say "SOMETIMES" because even though I listen to the radio whenever I'm approaching the bridge, sometimes they don't mention an opening and I get stuck sitting in bumper to bumper traffic for an hour or more. Well, tonight was one of those wonderful nights. I left the office late because I had a report to finish up and actually was excited because there was a lot less traffic than usual, and I was getting all the green lights. A KYW traffic report came on at 5:32 and they didn't say anything about the bridge. At about 5:38 or so, I passed the exit where I would normally veer off and take the other bridge if need be and then about 30 seconds later, I saw all the red headlights in front of me in a long line as far as I could see. Oh "****" I thought to myself, because I just KNEW it was a bridge opening. What else could it be?? About 3 minutes later (at 5:42), another KYW traffic report came on, and right at the end they said "The Tacony Palmyra Bridge is backed up in both directions because a bridge opening just finished up". Now, each time it opens, it takes about 20 to 30 minutes, so I KNOW that at 5:32 the bridge was open and they didn't say anything! Well, anyway, that pretty much pissed me off because I knew it would add at least 45 minutes to my travel time (it ended up adding about 50 min). I realized at this point that I hadn't taken my photo of the day yet, so thought that this was a perfect occasion to do some experimenting. I've always wanted to get some cool shots of car headlights at night with streaks and such, and this very frustrating event gave me a chance to do that. So, I think one of my new year's resolutions should be to try and find the silver lining in every situation. I don't realize sometimes how good I've got it, so at times like these, I need to sit back and make the situation better somehow. So I grabbed a few cool headlights shots. This is one of my favorite. Click on the pic to see it enlarged in all it's glory! Enjoy!! So Heather brought in this fruit cake today wrapped in cheese cloth so I could try it. I don't think I'd ever actually had fruit cake before. I can just remember some movie or something where it was Christmas time and everyone was sending fruit cakes. Maybe it was a TV commercial or something. Well anyway, whatever it was, it didn't make fruit cakes seem very appealing. And then when I saw the one Heather brought, I got a little scared. I mean, look at what she wrapped it in! Well, anyway, I finally opened it up in the afternoon and sliced a piece for myself (from the interior so it would be moist) and gave it a shot. It was quite good! It didn't have as strong a flavor as I expected and it wasn't super sweet either, which was nice. Apparently, Heather's mom told her to go easy on the Rum so that is probably why it wasn't a super strong flavor. But it was a nice texture and the dried fruits inside were tasty. All in all I was quite pleased with my first fruit cake experience and I actually think the cheesecloth looks pretty cool! If you click on the photo, you can see a more enlarged version of it. So most of you probably don't know what my drive to work is like. Well, let's just say that the title for this blog post is a bit sarcastic. I drive through northeast Philly and then over the Tacony-Palmyra bridge (which is probably the only part I would call "scenic") and then along Route 73 through a bunch of industrialized areas in New Jersey until I get to work. It's a very congested commute that takes between 40 and 50 minutes. It really isn't a very nice drive, but on certain mornings, especially in the winter time, there are some beautiful sunrises I get to witness. In the winter, the trees don't have leaves and I just love the contrast between the dark trunks and branches and the colorful sky. On these days I actually enjoy part of my drive and wish it could last longer. I took this picture this morning on my way to work when the sky was looking particularly beautiful. Unfortunately, because it is stop-and-go driving, I don't really have a chance to frame it well and make sure it is in focus and exposed properly. So this picture shows the sometimes joy of driving to work, as well as my frustration at the whole procedure! Anyway, I hope you enjoy it. So today Heather decided to try out this new hand lotion she received as a Christmas gift from someone who clearly doesn't know she isn't very girly. Well anyway, Heather had never tried lotion from Bath and Body Works before so she didn't know what to expect. She put the lotion on and started rubbing her hands together. She then said "It's kind of sticky ..." Then she said, "Oh wait, maybe that's because this is soap, not lotion!" and started laughing hysterically at herself. It was awesome. Just thinking about doing that myself gives me the heebie jeebies. It must have felt really weird! Anyway, if you click on the photo, you'll see an enlarged version where it is obviously "Moisturizing Hand Soap" and NOT hand lotion!! Way to start the new year! On another note, I wrote "2006" as the year in my notebook today instead of "2007". I knew I was going to do it but felt stupid when I did! This is a picture of Liam, a 15-month old boy who is the son of two of Erin and Matt's friends. The boy was awake all night until this point (about 1 AM) and was having a blast. He was very well behaved and cute. His father put the bottle in his lap after he fell asleep on the couch and it was just a perfect photo opportunity I had to take it. Happy New Year everyone! So those of you who followed my last blog found that it was okay, but I didn't do a great job keeping up with it. I may go back and start it up again, but I'm not sure. I read a few months ago about a guy who did a photo project where he took at least one photo every single day and then chose one to basically represent each day. Sort of a photo montage of the entire year. I thought that sounded cool, and it's the sort of thing where there is a specific goal: 1 photo a day. That sounds like something I could do. I decided to make it a new year's resolution to do a photo a day and post it up to a blog. Now, just to warn you, my new year's resolution last year was to make one recipe from each Gourmet magazine for the whole year (I got a subscription to it for Christmas last year). Now I started off okay with that and I made one from each of the first 2 or 3, but then I got behind. I never really caught up. I think I made about 4 or 5 (and I made one of them a couple times). So it wasn't too bad. I am very bad at New Year's resolutions and so don't usually do them. I'm going to keep my recipe resolution because now my sister gave me a subscription to Bon Appetit. However, I'm also going to try for the photo one. It seems a little ambitious, but ... one photo a day? That can't be too hard, right? I've already got a great one that I took this morning at about 1 AM. I'll post it later because I have to transfer from my camera. I think you'll like it. I'm writing this introduction to let you all know of my goal, and to ask for your support. If you notice me missing days, or if I haven't posted yet and it's getting late at night, maybe you could drop me a call or email and remind me. If I know people are following my posts and looking forward to each day, it might help inspire me to keep up with it. Thanks, and please enjoy. Oh yeah, and have a very happy and prosperous New Year!